Don’t get me wrong, I love my deep-fried fish fillets—preferably wedged between two sides of a warm and soft taco shell, embedded between a sprinkling of vibrant vegetables and topped with some form of zesty sauce. But we can’t always have what we want. Sometimes we have to (try to be) somewhat (kind of) healthy (keyword: sometimes). And besides, summer is a time for light food cravings: think ice water and fun salads and cool cucumbers. No but really, have you ever munched on a raw cucumber straight from the fridge? Heaven. So one of my favorite things to do over the summer is cook up lightened-up versions of my favorite foods. Thus, these lovely fish fillets were born. I’m still working on the light brownies. 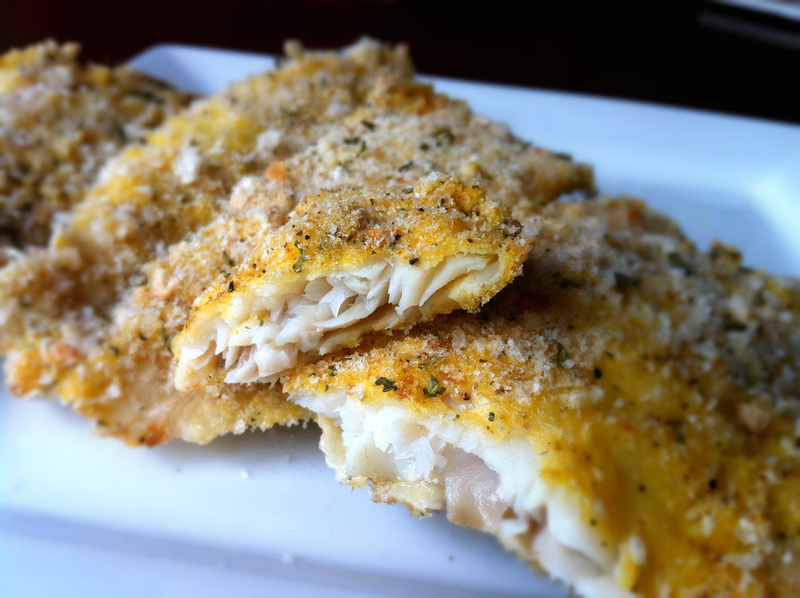 Fish is one of the most versatile and proteinaceous foods out there, and this recipe gives you plenty of creative room. The flavor here is fairly neutral: salty and slightly pepper-y, making it easily paired into any dish you desire. Toss a fillet onto a summer salad, make a healthy fish wrap, put it in a sandwich with some mustard and lettuce, or eat it straight with a side of rice and veggies. The world is yours for the taking! 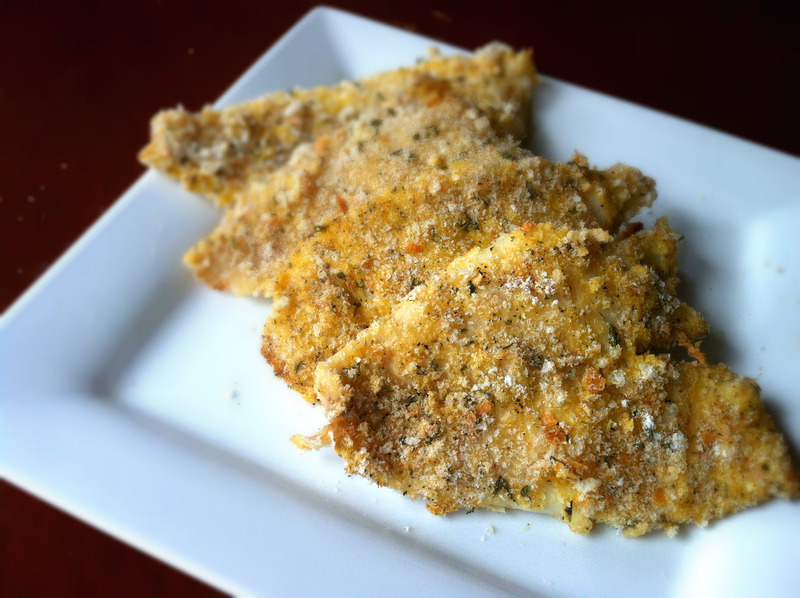 2 cups breadcrumbs – You can take some stale bread, shave off the crust, and crumble. Or: take some regular bread, shave off the crust, crumble the bread, and toast in the oven until dry. Or: buy ready-made breadcrumbs. They’re so worth it. optional: any other seasonings you want. 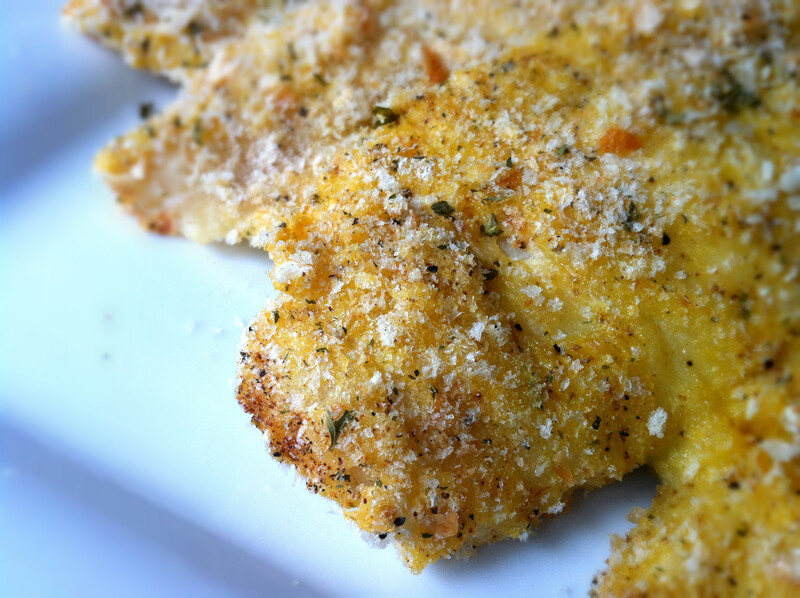 I added parsley flakes and some oregano to the breadcrumbs! 1. Preheat oven to 400ºF. 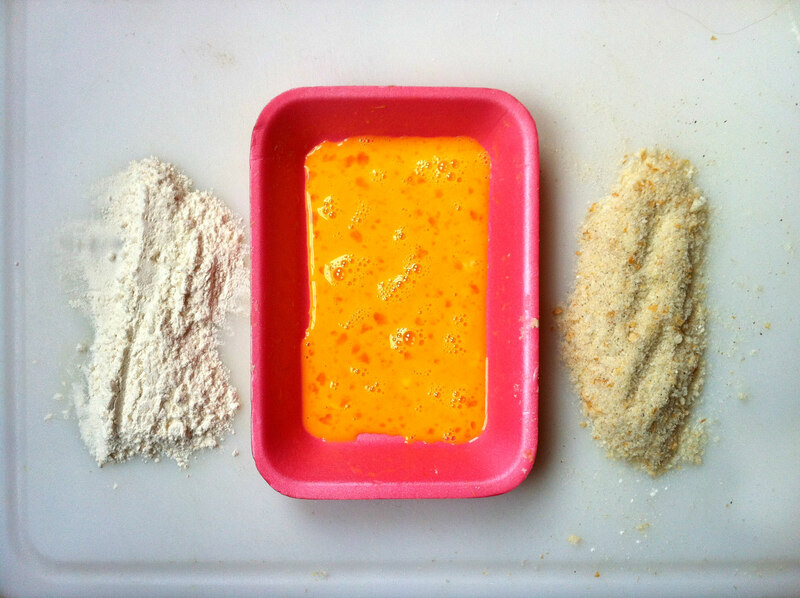 Set up a workstation: put 1 cup flour on the left, then the 2 beaten eggs, and then the 2 cups of breadcrumbs. 2. One at a time, dredge the fillets. Coat in flour first and shake off excess. Then dip both sides into the eggs and let the excess drip away. Finally, coat both sides generously in breadcrumbs. 3. 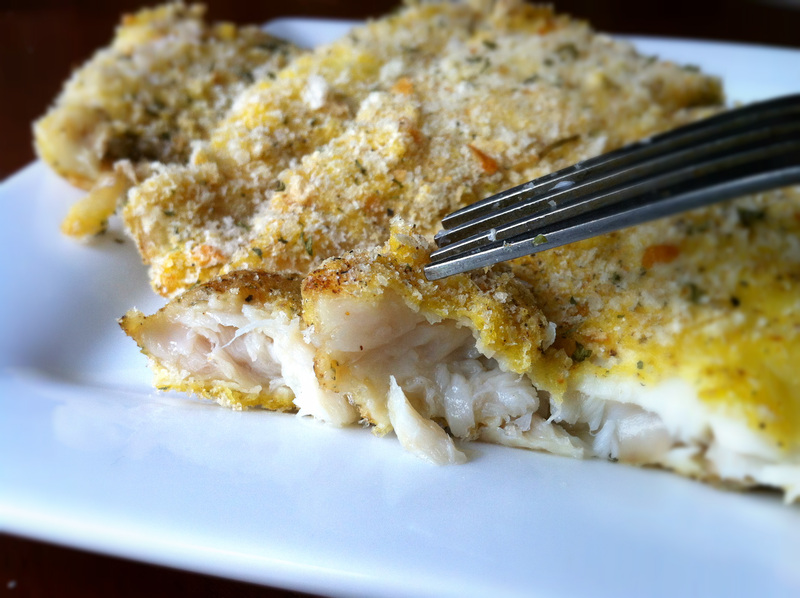 Place the fish fillets in a baking dish and bake for 15-20 minutes, until they’re flaky and done on the inside. You’re finished! Mmm. Look at that heavenly breadcrumbbing going on. It’s crispy on the outside, flaky on the inside. Prepare to impress your friends and your colleagues with your amazing cooking abilities and your amazing new waistline. Your tongue won’t even know the oil-free difference. QOTD: What’s your favorite baked food? 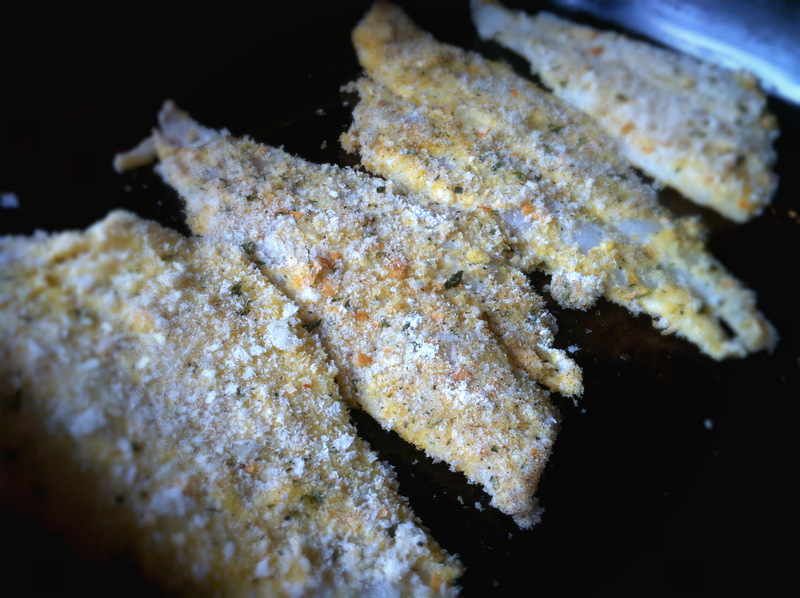 I adore breaded fish! Mmmm! So simple to make and took delicious! I love fish !! Your fish look like delicious perfection!